This card uses the Echo Park Just Be You paper pad and Element Stickers. I love this collection and used it once before in my April 14th blog post (Birthday Wallet Card). The papers in the pad are so versatile and with the matching stickers and ephemera packs you can create a card or scrapbook page in no time at all! I found that Mint Macaron cardstock from Stampin' Up goes great with the mint colored papers in the Echo Park pad. I also added some SU Strawberry Slush paper pieces to the card. 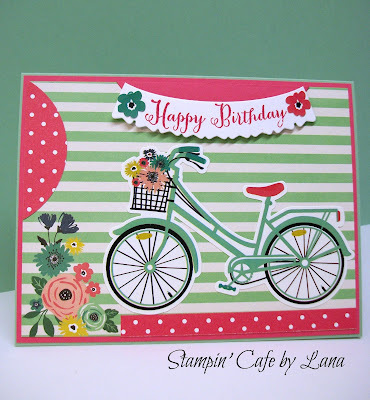 The Happy Birthday is stamped with a stamp from Remembering Your Birthday, a retired stamp set by Stampin' Up. I cut the banner using the Siissix Thinlets by Rachael Bright. Card base is in Mint Macaron, 5-1/2 x 4-1/4 inches, top folding. The mint striped paper with the floral image in the left corner is from the Echo Park Just Be You paper pad. I added a small strip of Strawberry Slush paper to the bottom and a portion of a circle cut in the same paper to the left. I added another partial circle in Strawberry Slush behind the banner. 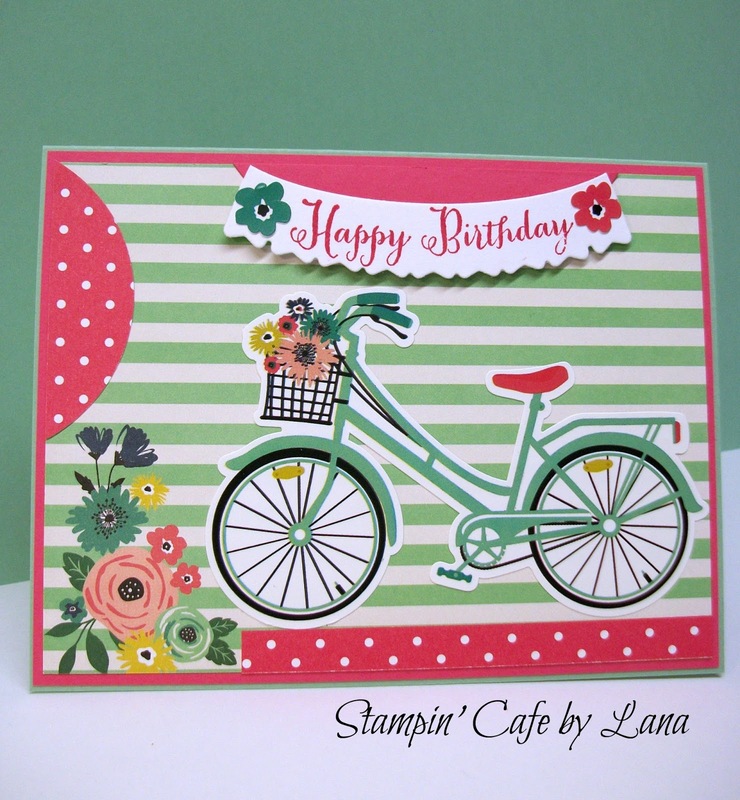 I used Strawberry Slush to stamp the birthday greeting and added some small flowers from the sticker sheet, along with the bicycle. Another very quick card, basically layer, peel and stick!